As a rule stairlifts fall into two categories, depending on whether the staircase itself is straight (a single flight of stairs without twists, corners or bends) or curved (multiple flights around corners or bends). 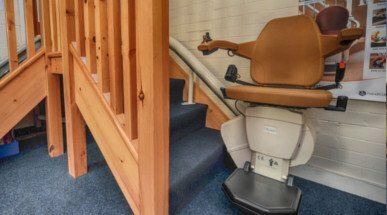 Straight stairlifts are cheaper, simpler and have a much quicker lead-time, opposed to Curved lifts that require a more expensive bespoke track, built exclusively for that particular staircase. Are there any physical obstacles for the lift, most commonly at the top or bottom of the stairs that may make using the lift more difficult such as furniture or a radiator? If so these may need to be moved to give the user more space to enter or exit the stairlift. It should also be considered if other people will be using the staircase, if so other precautions might be recommended, such as a more compact lift, to offer more walking space. Does the intended user struggle to get out of chairs? Are they capable of activating the stairlift’s controls? Do they weigh less than the maximum user weight? These sorts of questions and others may seem probing, but they will help to narrow down our recommendations. There can be a significant price difference between lifts, mostly affected by specification, so having an idea what you want to spend is always helpful. For example instead of an expensive curved stairlift, a user may opt for two straight lifts, and to move between them at the corner platform. There will also likely be the opportunity for a reconditioned lift, or for short-term users, a rental option may prove far cheaper too. At DSL we offer a free stairlift survey, where we visit the property, measure the staircase and talk through suitable options with the client, carers and relatives. These surveys are carried out by our specialist stairlift engineers, not salesmen on a commission, so we can provide honest advice.